Имате въпрос към Auravel Grande Hotel and Resort? Ако това, което търсите е хотел с добро местоположение в San Pablo City, не се колебайте, а изберете Auravel Grande Hotel and Resort. Вълнуващият център на града е само на 109.7 km оттук. С удобното си местоположение хотелът предлага лесен достъп до всички градски забележителности, които задължително трябва да се видят. В Auravel Grande Hotel and Resort отличното обслужване и достъпните съоръжения допринасят за Вашия незабравим престой. Гостите на хотела могат да ползват съоръжения като 24-часова охрана, ежедневно почистване, безплатен WiFi достъп във всички стаи, 24-часова рецепция, Wi-Fi връзка в общите части. Дизайнът на хотела е съобразен с най-високите изисквания за удобство и комфорт, осигурявани от съоръжения достъпни в някои стаи като пантофи, диван, хавлии, гардеробна, достъп до интернет (безжичен). Освен това в хотела можете да се възползвате от множество предложения за приятно прекарване на свободното време. Когато търсите удобно и комфортно място за настаняване в San Pablo City, изберете Auravel Grande Hotel and Resort, който ще се превърне във втория Ви дом. Hotel is recommendable the problem they are not linient! I attended a wedding in that area at 3pm and a business meeting on followin day so i book in thehotel so i can do my make up and dress up, i was as early as 10am they told me i have to pay for early check in around 250 an hour so i am thinking instead of paying them i will just have a good lunch at there restaurant and waited for the time. When its almost 1pm i went to the front desk and ask favor if can do early check in since check in time is at 2pm so i said i just want to ask since other hotels allow early check in if rooms are available but they answer was “No” i still need to pay for 1 hour early check in! So i did pay, I just realized they are not linient to their client they cant give extra miles and think that there business is hospitality so they should be hospitable in a way of little consideration. But still i pay. But you know what? i will never go back to that hotel again no more business with them! This place is quiet, spacious, has a close-to-nature feel because of the many trees and well-maintained gardens, and clean swimming pools. We really enjoyed our stay. The breakfast is also good but limited to canned corned beef, canned mushrooms, fried dangit and fried egg only. The cafeteria is new, you can see it from the furniture. It is also a good place to hold events as there are many function rooms and parking slots. 1] The family room where we stayed is a large room (in terms of floor area); 2] Staff are very courteous and helpful; and 3] The food is good, when we took our breakfast. We are a family of four who stayed in San Pablo for the weekend. Generally, our stay in Auravel Grande Hotel was very pleasant. There was no hot water from the shower because it was a Sunday, the repairman will not be able to fix it that day. Auravel Hotel allowed us use the bathroom of unoccupied room next to our room. Thank you for the courtesy shown to us. More power! The rooms are smaller than they look in the photos. Also I'm pretty sure there were bedbugs because both me and my girlfriend were itchy at night and the bites were visible the next morning. It was bearable though for me and i stayed 3 nights in total. The hotel is peaceful and quiet and away from the highway. It's not too hard to get a trike or a jeepney going into town. Breakfast was served in the beautiful modern restaurant but the menu promised more than it could deliver - the western breakfast (omelet, or eggs benedict) was barely passable (they should just take it off the menu), the filipino options were somewhat better. Отседнахме 5 вечер/и в август 2018 г.
I recommend this hotel to everyone! We stayed here because we went to Bato Springs which was maybe 20 minutes away. The hotel has a lot to offer (pool, cafe, restaurant, function room, car wash and more) and is very attractive, clean and appealing in person with it’s cute designs. Was not expecting much because we didn’t pay much but wow, value for money was great! Makes you want to tip everyone! Food was delicious and presentation was at it’s best! We booked a standard room and it was very clean and the in-room bathroom toilet was modern with it’s built in bidet. Although small, the room was clean, comfortable and functional and the AC cools well (if you hate the heat). My favorite place was Auravel Fusion Cuisine (the hotel restaurant) and Cafe Avelino. They’re worth 5 stars if you ask me. Lastly, staffs were all wearing their welcoming smiles. All were kind, knowledgeable and friendly. Kudos to all staffs. We would be happy to come back here! 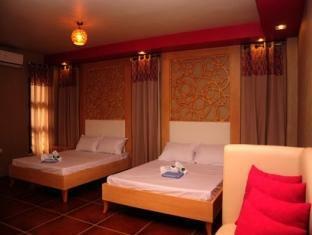 Auravel is a nice play to stay in San Pablo, Laguna. They have a new restaurant and a new coffee shop next to it. They have good food too. Staff is always helpful and accommodating. Pros: Excellent Service, Good Food, Really nice cafe. For 2 mornings in our room and our food were never cooked per our request. Great food selection at the Auravel Resto - KUDOS to Exec Chef Charisse Bustos kitchen staff!!! Hello Ma'am Angel! Thank you for your wonderful feedback. Rest assured that Chef Aljen and the whole staff will be hearing about your review. Come back soon! 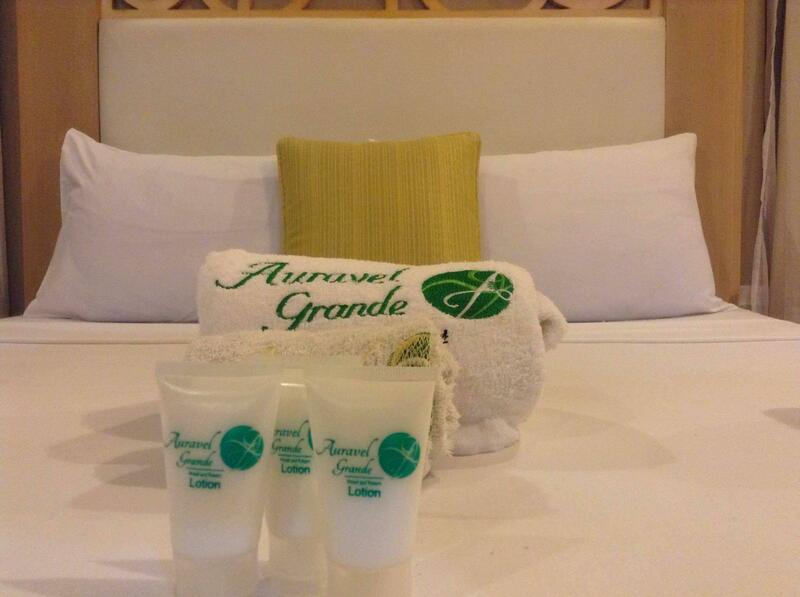 Thank you for choosing Auravel Hotel! Stayed in San Pablo last year at an hotel that was subpar that made my trip to San Pablo this year worry some. However, after reviewing and staying at Agoda I look forward to staying in San Pablo again next year. The food was great, the room was clean, and the amenities were very suitable. Very happy with this find! The staff are great by the way and very helpful. Greetings Mr. Trevor, We are glad that you enjoyed your stay with us. We hope to see you again. Also, we would like you to know that we're going to have a new restaurant that features fusion cuisine. We hope to serve you at our restaurant as well. Thank you so much for choosing Auravel Hotel. Greetings Mrs. Eloisa Sanchez, Thank you for you great feedback. We are looking forward to serve you better on your next stay. We hope to see you again. Thank you for choosing Auravel Hotel! We are happy to return to Auravel each time. We were pleased to discover that the 3rd floor rooms have better lighting compared to the ones on the 2nd floor. Our constant peeve is their bath towel -- after drying off we are always left with lint clusters! We like bringing our own towels instead. Secure. Tucked away from the Maharlika Highway but not too far from the city proper. Appreciate the well-maintained garden and the right amount of farm trees even at the parking area. Would appreciate brighter lighting in the room. The room was small and not sound-proof. Hotel room is abit overpriced in terms of its size compare to other hotel in Philippines. Breakfast was good specially the beef tapa. Service of the staff could be improved most specially the front office team. Our stay was great as the staff was very helpful and courteous. The hotel and the surrounding grounds are well kept and the room we stayed in was very spacious. The pool was open even after 10pm however no heater so it may be a cool to cold swim for some. Aside from the pool, there was no other thing to do. Privacy is not an issue although there are times you could hear things through the walls or from the door. Overall, we had a very pleasant stay at this hotel. Great for passing through especially for those that are on a budget. We booked it the night before we check-in this hotel, so we found much surprises here as we know the actual view is always different from website pictures. We found not many tricycle driver know about the hotel location with showing address and map so we guess this hotel is new in San Pablo city. From the very beginning we check in, having a meal in restaurant, taking meal order by in-room phone to the time we check out, everything goes smooth and all staff are nice & smily. They even aggressively helped us to carry our suitcases to room and the morning some female staff saw us while we proceeded to concierge, they just immediately came to give a hand, that was very warm to guest. Room is clean, variety of television channels so you can entertain yourself, room size is fair but not spacious. Shower and air-con temperature are good also. There is one step need to be aware that right under the sink & tape, I tried couples of time that feet almost get stumbled when careless. Hope it could be improved. Although the swimming pool is not big, but still alright when we swam in morning and there were only few peoples. You can have relaxing time in swimming pool under nice weather. And one thing need to mention that is food quality in restaurant. We entered to restaurant where next to concierge to have our late lunch in afternoon time, they still provide everything in menu. Surprisingly the price is really reasonable that a canton noodles & pork sour soup we have ordered are within 200 peso each and the portion is perfect for two. Service is good too. The complimentary breakfast we have tried were nice. Hotel service provided is really appreciated and the price is value for money. No doubt to visit again if go travel here next time. It’s ok. Nothing to special about the place. I want to commend the front desk for giving her best to assist my family and provide everything that we needed.